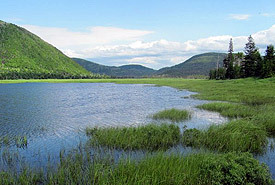 NCC’s Grasses Nature Reserve is located at the headwaters of Robinsons River in southwest Newfoundland, 25 kilometres from Stephenville Crossing. This remote 3,879-acre (1,570-hectare) property is hidden in the Long Range Mountains; the most northerly extension of the Appalachian Mountains in North America. The Grasses is one of the largest projects NCC has ever undertaken in Atlantic Canada. It has been long identified as an area of ecological significance and is named for its extensive natural riverside grasses. As the largest wetland of its type in the province it provides habitat for several rare or uncommon plant species, such as Farwell’s water-milfoil. In 2014, NCC conducted a study that confirmed the presence of the provincially threatened Newfoundland marten in the Grasses. Other wildlife using this habitat include the La Poile woodland caribou herd, black bear and a diversity of forest songbirds and waterfowl.